Fozzy Review 2019: Is Fozzy a Good Hosting? Fozzy uses state-of-the-art technology to provide some of the fastest website hosting solutions in Europe, Asia, and the United States. This is the hosting vendor you go to when you want an affordable and speedy web hosting service. Manned by a team of web hosting gurus, Fozzy has built a platform that combines excellent services and affordability with top-notch customer support. With data centers located in five locations across the globe, Fozzy prides themselves on delivering highly sought-after hosting services for a customer base spanning three continents: Asia, North America, and Europe. The Fozzy website is available in Russian and English. Their shared hosting service comes with a free .XYZ domain, unlimited subdomains and emails, daily backups, spam protection, a minimum of 10GB SSD storage space, and free setup. They only have two plans: Fast Site and 5 Fast Sites. As the plan names would indicate, the main difference between the plans is the number of websites each plan can accommodate: with the 5 Fast Sites plan, it basically multiplies the resources of the Fast Site plan by five. Frankly, I wasn’t impressed by Fozzy’s inclusion of a free .XYZ domain: most shared hosting services would include a free .com domain with their packages, and the .XYZ extension is rarely used for a professional business front. I was placated to see their inclusion of a free CDN and daily backups, however; the former is something that shared hosting services rarely include with their entry-level packages, while the latter is a value-added service that always earns extra points with me. If you’re based in the Netherlands, you also get a free dedicated IPv6 address with your shared hosting plan. This was a nice perk, and a fairly rare one in the web hosting industry. Fozzy’s VPS solutions allow users the option of unmanaged or managed VPS hosting. They have the standard Linux and Windows VPS hosting, but I think their Forex VPS solutions are particularly noteworthy: they boast a connection time of less than a millisecond to the leading Forex companies, since their servers are located in the same data center as these foreign exchange markets. They’ve even made it as easy as possible for you to manage your Forex servers: you can access the user control panels directly from your iOS or Android smartphones (as well as your desktop, of course). Fozzy doesn’t appear to have a readily-advertised uptime guarantee for any of their plans. However, my tests yielded an average uptime of 99.94%, so they do seem to be as reliable as they claim. Fozzy gives their customers up to seven days to pay, essentially allowing users a one-week trial of their hosting solutions. Interestingly, while their shared hosting plans don’t include a money back guarantee, their VPS hosting plans do. What’s more, if you’re moving over from another hosting provider, you’re eligible for a free month of hosting with the purchase of any plan once you provide proof of your previous hosting contract. Fozzy’s 24/7/365 technical support provides several options, including a ticketing system, email, Skype, and their website contact form. You’ll have to log in to access the contact form if you’re a customer. Their support team is polite and resourceful: when I contacted them via Skype, I was connected with a technician almost immediately, who promptly addressed my concerns. The number of support channels available seems to depend on the language you’re requesting it in. For instance, the English version of their website doesn’t have a live chat, but the Russian version does. Also, the Indian version of their website has a phone number listed, but I can’t say the same for any of the other versions. That said, for typical support scenarios, the available channels should suffice. 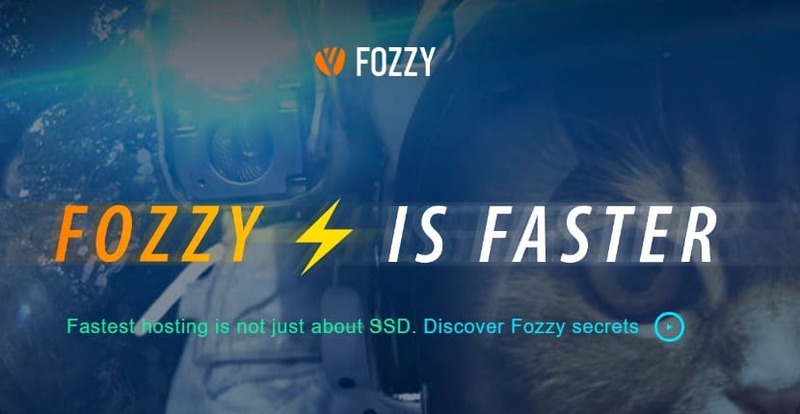 Fozzy is indeed a fast and reliable web hosting provider, but they seem to lean towards Forex traders and companies rather than typical corporate webfronts. The lack of a free .com domain registration may be a deal breaker for some. Wondering how Fozzy stacks up against other Web Hosting companies? Enter any other Web Hosting company and we will give you a side-by-side comparison.